Not required for access to published data. 1. Published data is available without a login. For access to unpublished or restricted data you will need to login. If gene name is not found, please look up HGNC ID or Ensembl ID - a link is provided. Note that this links to the version of ENSEMBL used to generate the data. This will bring up a table of genes that fulfil the search terms, and a table of transcripts for the selected gene. Clicking on the ENSEMBL IDs in the table will take you to the ENSMBL website for that gene/trancript. 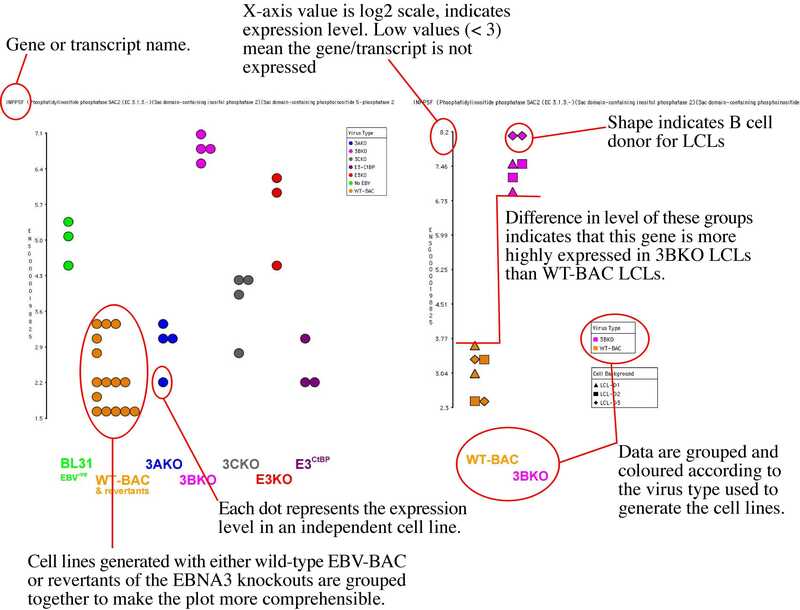 The gene level data is diplayed in the form of a dotplot. Important facets of the plot are indicated in the pair of examples below. Dotplots for individual genes and transcripts can be selected with the buttons in the table. For more detail on the motivation behind this website, an overview of the experimental approach and the detail of the observations, click here. Please direct any queries or issues with this website or the microarray data to Rob White.